After the Write Stuff Conference at the end of March, I sat down with my good friend and fellow GLWVG member, John Evans, to ask if he’d consider setting up the Pennsylvania equivalent of NJAN (The New Jersey Authors Network). I’m delighted to say he agreed to take on the challenge. 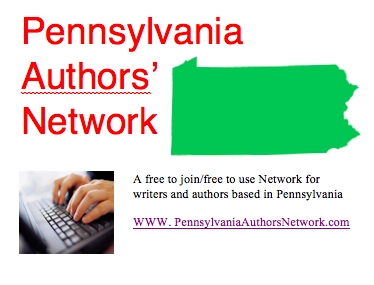 The Pennsylvania Authors Network (PennAN) is a free to join, free to use network of writers and authors based in (or near) the Keystone state. Members work together to put on events, usually in the form of a panel/Q&A, at libraries and other venues around Pennsylvania. As NJAN became better known, something unexpected happened. Other organizations started approaching us, requesting we provide authors for book fairs; speakers for everything from regular, 'How I Done Wrote My Book', talks at book clubs and 55+ communities, to guests of honor for Author Luncheons, to writerly workshops and presentations (including panel/Q&A events and writing conference speakers). Once PennAn becomes more established, I have no doubt similar unexpected benefits will come to its members too. If you’re a writer based in Pennsylvania or New Jersey, feel free to check us out. To become a member, all you need do is join the Yahoo Group. As someone based in DE, choosing between PA and NJ is problimatic. I may run it by someone who is better at promoting than I am and see if she will do it. If I started one I fear it would langush.